Good morning. It’s a beautiful Monday morning in Chicago. I’m on my drive to Evanston, IL, to my office. The sun is shining brightly. The temperature is lukewarm. The traffic is horrible. There is construction everywhere. I’m going to discuss why transformation of training and learning organizations is important, how running training like a business and how its concepts can be enablers for transformation, and, lastly, how outsourcing can be one of the tools or levers that you can use as part of the transformation process to get you where you want to get to. So, let’s start with transformation and why transformation is important. In my experience, there are a set of questions that learning leaders and chief financial officers (CFOs), chief executive officers (CEOs), chief operation officers (COOs), and executives in charge have difficulty in answering. What are those questions? 1. How much are we spending? I’m going to talk in detail about this. It’s abnormal for anyone to be able to answer the question, how much are we spending on training? because it goes on everywhere and, normally, organizations don’t have their arms around it. 2. What are you getting for it? That’s the most important question. Regardless of what you’re spending, if you’re getting nothing for it, then you are overspending. And quite frankly, if you are getting tons for it, if you know you are getting a lot of value, then perhaps you are underspending and you ought to invest more. 3. Are you organizing the right way to deliver the kinds of values that are possible? 4. Do you have the right mix of fixed and variable resources? 5. Are you heavy on fixed resources, which gives you limited flexibility and scalability and also lots of fixed cost, or are you using outside resources both to variable(ize) your cost and to provide you access to, maybe, capabilities you don’t have or can’t build on your own? 6. Do you have the right mix of modalities and deliveries? 7. Are you pulling people off the job a lot to do this stuff, or are you utilizing the technologies that are available to you these days to minimize time off the job? 8. Are you using vendors in the right ways, and are you leveraging both vendors and resources to deliver what you’re trying to deliver? 9. Are you delivering a competitive advantage from the investment being made to your company? 1. Create more value for the investment being made. 2. Get your cost to acceptance levels. 3. Become more relevant to the business. Of course, one and three are closely linked. Becoming more relevant means getting connected, being intimate with the business, and understanding its needs. And number one is taking those needs, figuring out if learning can be an enabler to move the lever on some business issue or challenge or need, and then delivering it in a way that makes a difference. So, with that, I’m going to next talk about cost and how to ensure that you’re looking at cost in the right way and getting it under control and to acceptable levels. OK, let’s start this blog with a couple of thoughts on my part here. First, I never thought I’d ever do a blog. I had in mind that a blog is this thing where people write short, quick sentences and thoughts and get lots of responses and go back and forth, and back and forth. Our head of marketing, Kimberley Kelly, informed me that for our purposes, it’s not that. It’s really about putting forth some ideas that might stimulate some conversation, and the ideas have to be complete enough so that people understand and read and then respond if they care to. So, I then said: Well, jeez, I don’t have time do that. That’s going to take a lot of effort. And I finally said OK. I relented. And that’s what I’m doing. I’m on my way to the office this morning, and I thought I would just talk about value creation. That’s the topic of today’s blog. So, what do I mean by value creation? What I mean is that learning and training organizations need to deliver quantifiable value for the investments being made in them. And what do quantifiable values look like? Well, they can look like, traditionally, things such as smile sheets that get high ratings or even level 2 high ratings. I would suggest that it really ought to be about the business and we ought to have a series of measures. There is a business metric that determines values we create. So, what are those measures? The thing about value creation is that it has to be in the eyes of the customer. So, let’s just spend a moment talking about who the customers of training are, because then we can figure out how we can understand what’s important to them and how to measure the work that we do to ensure it is delivering value and meeting their needs and requirements. And my point of all this is that all three customer groups have a set of needs; those needs we need to understand and deliver against. The employee’s need may be pretty simple: “I need a set of skills to do this job I have to do, or I have a need that has to do with employability.” And we can deliver training and learning against those needs and, in fact, measure it. And then the third group, the executives who provide the funding for the work that we do all through the organization . . . its needs may be totally different. This group may be concerned with things like employer of choice, employee retention, customer retention, customer satisfaction, and achievement of strategic objectives. •	What are you trying accomplish? •	What’s the skill set that you need? Then we measure the skill set gotten by some form or fashion, and then we move on. And I would submit that there is a larger view of this that we ought to be dealing with and we ought to be building a set of measurements around. So, value creation, then, is the delivery of those results that move the needle on business value or value and need as defined by the three customer bases. And things like productivity and sales revenue, employee satisfaction and employee retention, and meeting of objectives and holding of cost and productivity are critically important. So, how do we do this? •	Enabling the business by developing skills and capabilities that don’t exist today and then doing it. So, the value creation process, business linkage, first and foremost, begins there; if that doesn’t happen, nothing else matters in my mind. •	The customers then have the ability to make choices based on the level of value or cost or both, the level of effort, timing, etc. The third part of value creation is, I believe, measurement, only because it’s critically important early on in the transformation of a training organization. Transformation may be a too strong a word, but let’s go with it for now. In the transformation of a training organization, measurement is important because we have to earn the right to do the work that we do. Earn the right means we have to consistently deliver value, we have to consistently be responsive, we have to manage our cost, etc. And so, what my belief is that as we continue to measure and continue to demonstrate value and quantify it and the like, we ultimately build confidence in our customers that when they invest they get substantial value in return. At that point, and that point differs by organization, I’m certain, we can technically stop the measurement process, stop investing resources to do all this measurement stuff, because our customers are confident that when they invest they get value. So let me stop here and end with the statement I often make to organizations: It’s not about training; it’s about results. So, we need to change our mind-set to get away from training being the end, when, in fact, it is one of the means, and one of the means to delivering real value and delivering real business results. So, I went away. However, I continued to contact this learning leader over the course of the next year and a half, about once every two months. A year and a half later, on a Thursday afternoon, I got a call from this learning leader. Learning leader: I need help. Me: Great, let’s talk about it. Let’s get together. Learning leader: No, I really need help, and I really need help now. I’m getting intense pressure from the businesses to take cost out to become more relevant to create more value, and I thought I knew how to do this, but I don’t think I do, so I need to talk with you about this. Me: OK, fine, how about I come see you next week sometime? Learning leader: No, how about I come see you tomorrow morning? And so, he flew from a large city in the Midwest to a large city on the East Coast the next morning. We talked and put together a strategy for him to get his arms around what was going on and put forth some ideas and recommendations and some action plans with an associated business case. He was thrilled. He went back and was excited about the opportunity to take control of his situation. These are all signs that in the business world, when customers say such things, providers or suppliers listen to them and, in fact, take some sort of action. My point is it’s critically important to listen, it’s critically important to ask, and it’s critically important to understand what your customers expect of you. Quiz and quantify the terms. If you haven’t asked your customers what they expect of you, you should. When I say customers, now I’m talking about senior executives who are paying the tab, ultimately, for the work that you do and the organization you have and all the training that you develop or buy and deliver. So, ask them what they expect, document what they expect, and look across the executives. And I suspect you will find they have common expectations. And if that’s so, then you should be able to put them into what I call an expectations map, a customer expectations map, which you use as a measurement system for how you are doing. These are critically important questions. They are things you need to do as you run this activity called training and development. Remember, you are spending a lot of money. You are entrusted with making certain that that money is being spent on things that make a difference for the business. If you’re not doing that, then in my mind, you are under performing and you are becoming irrelevant and you might find yourself in the same shoes as that senior training person I described earlier in my story. Look, I’m giving you this advice because I have seen it work, and I know that it works. I have seen learning leaders do this quite effectively. And at the end of the day, they find themselves in a position where their customers are confident that when they invest in them, they are getting something back for that investment that is on a par with other investments that they make. My name is Ed Trolley, and I’m Vice President of Managed Training Services at NIIT. Welcome to my first blog. Actually, this is going to be a series of blogs. 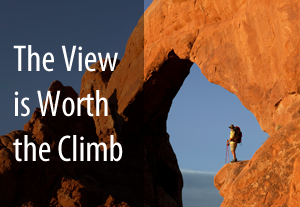 The theme of them is “The View is Worth the Climb.” What do I mean by that? What view? What climb? Let me describe that through a couple of stories. Over the last three weeks, I have had two discussions with senior learning leaders of a pretty sizeable company. They described to me how their company was structured. They were responsible for a very small corporate group, and their company was highly decentralized and therefore had a number of training groups across the company in the businesses and even in some of the functions. I submit that the view is worth the climb. If you created the burning platform, this would be a bold move on your part or on the part of the learning leader or the human resources (HR) leader, but someone should create the burning platform. So, that’s going to be the theme for the next seven or eight blogs. I’m going to talk about a number of things about why and how we got to this point where training is one of the largest unmanaged spends in corporations, particularly large corporations. • We don’t have duplication of resources, duplication of effort, and inconsistent delivery against very important topics. • Technology is being effectively leveraged. • Lower-value-added activities for the corporation are being appropriately leveraged. Knowing how much you are spending and what you are getting for it are the keys to the investment value equation, as I call it, and it’s been my belief for some time that the investment value equation in many corporations is broken. What I mean by broken is that there isn’t sufficient value being delivered for the investment being made in training and development. So, with that, I’m going to close this first blog. I welcome your comments, and I welcome your thoughts and insights. Stay tuned. We’ll be talking about this stuff in a lot more detail in the coming blogs. We found that less than 13% of learning leaders say that they can provide value and can demonstrate it in quantifiable metrics. 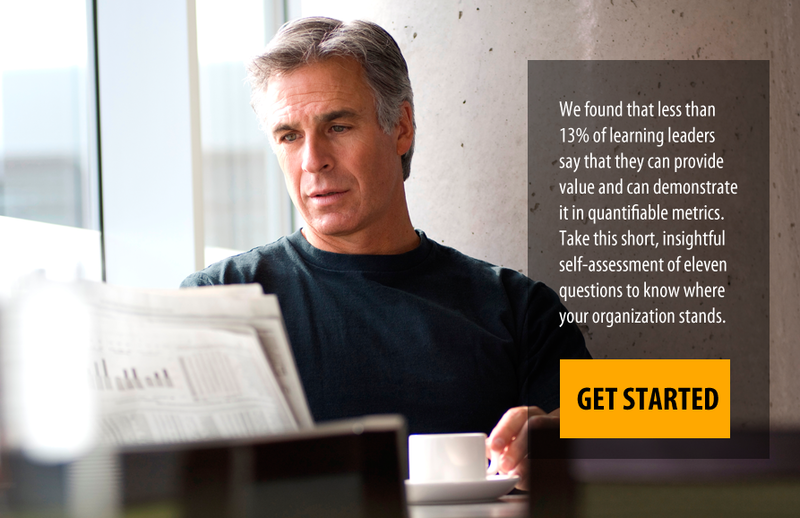 Take the self-assessment to know where your organization stands.